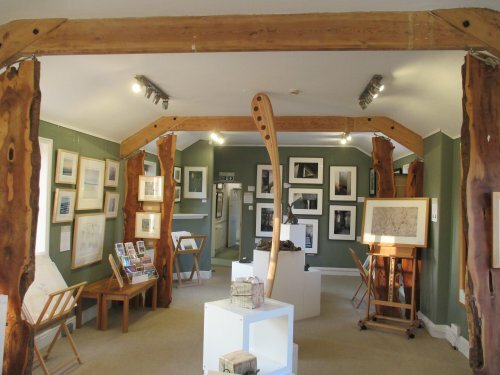 There is nothing run-down in Northallerton!, this is a busy prosperous market town with a great variety of shops, cafes and restaurants and the traditional market where you can buy a great selection of local produce. 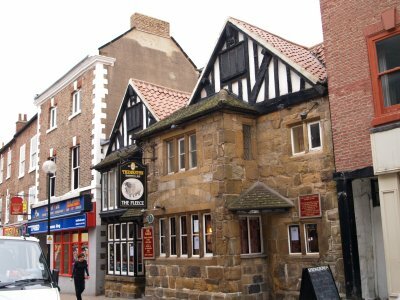 Northallerton is a busy bustling old market town and its station is on the equally busy and convenient East Coast main-line. 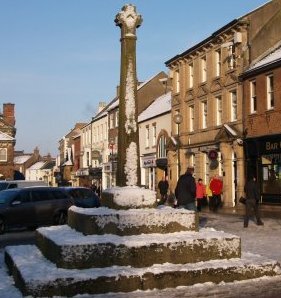 The modern market cross replaces the medieval cross in Northallerton but the traditions of a busy market town are more than well preserved - its friendly place with a huge variety of shops, cafes and pubs all within a short walk of each other. 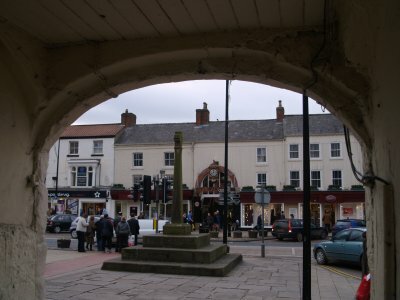 The architecturally boring Northallerton Town Hall of 1873 is on the left but is surrounded by a variety of good shops and the town is even more popular on market days when both sides of the broad High Street have long rows of market stalls. 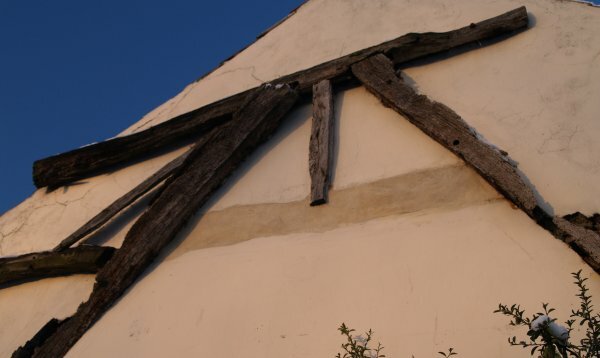 At the end of the High Street of Northallerton you can see remnants of what was a cruck framed house (much rebuilt-developed since medieval times) at the end of building housing Northallerton's The Nags Head and the Smart Allick's Ladies and Men's Wear shop! 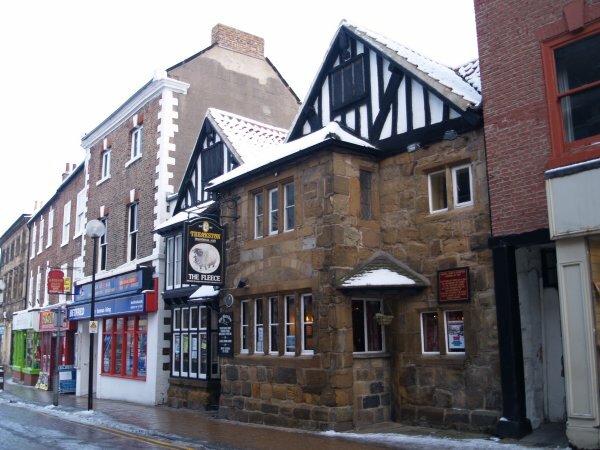 The Fleece in Northallerton High Street is the oldest pub-inn and has two timber framed gables (ΔΔ) above two lower floors of stone walled construct and is partly medieval in origin. 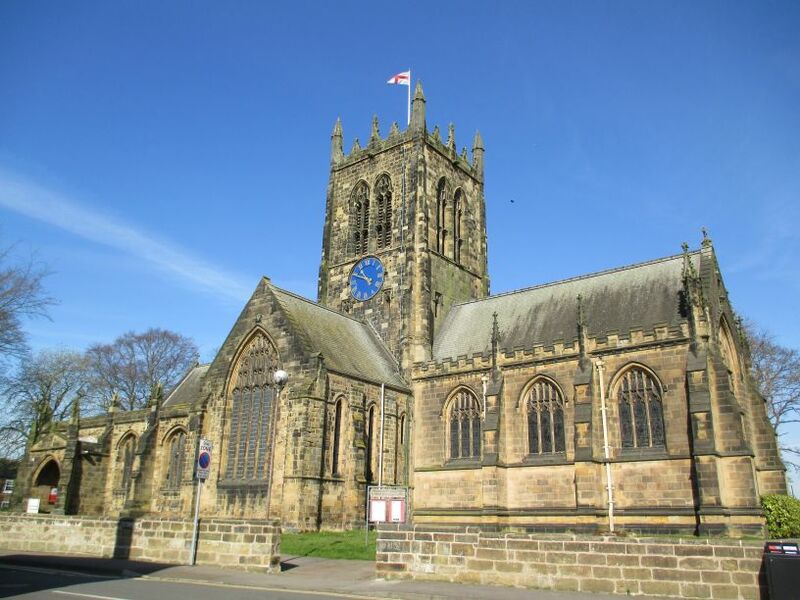 All Saints Parish Church, Northallerton is a dark imposing medieval building at the north end of the High Street. 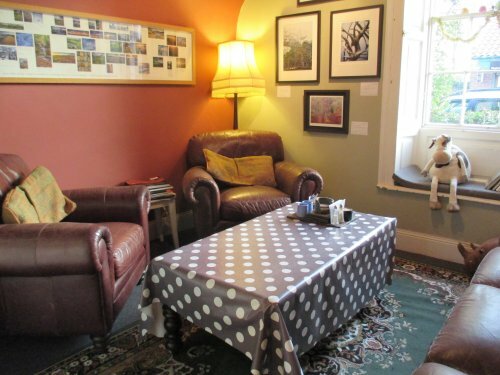 The imposing tower dates from 1420 and is built in the Perpendicular style of architecture. 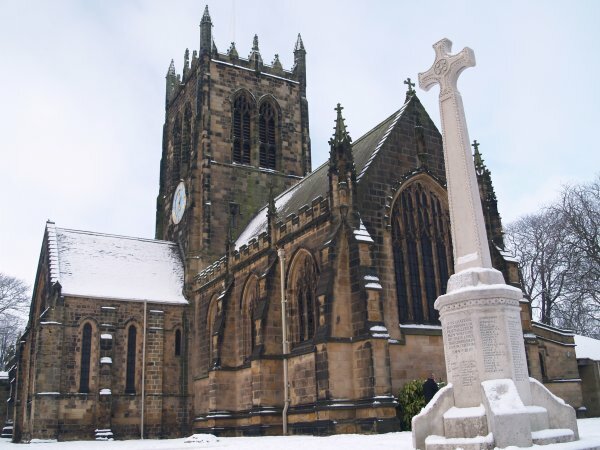 All Saints Parish Church, Northallerton is mainly Perpendicular in style of architecture though the chancel, on the right, is Victorian Perpendicular! 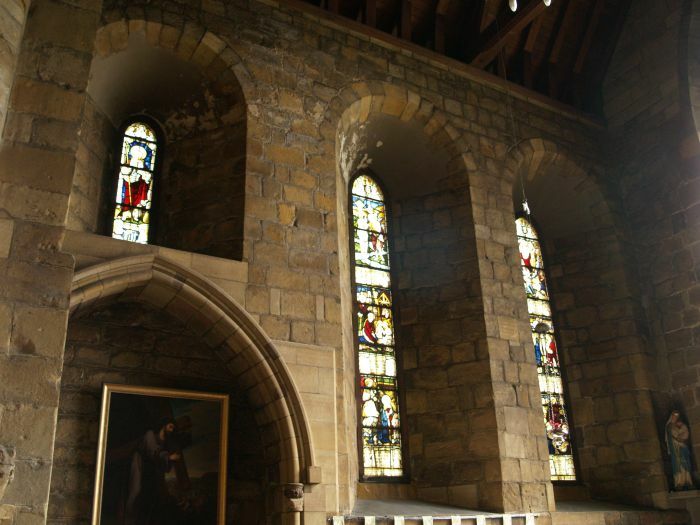 from 1885 by C. Hodgson and Fowler but both transepts, with long lancet windows, date from the early 13th century - you can see this clearly in the south transept on the left. 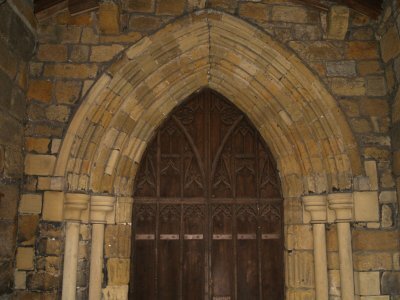 All Saints Parish Church, Northallerton: The west doorway on the left is Romanesque in style and older than most of the rest of the building, it has a round arch with three slight chamfers, possibly from ~1200 AD. 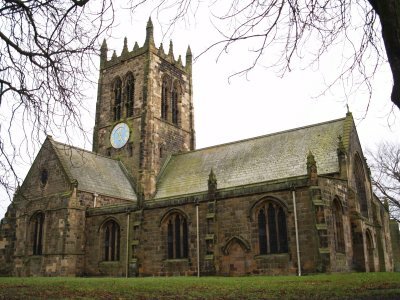 The nave is probably from after 1200 but still in the 13th century, so this is a fine old building indeed and still functioning as the principal parish church. 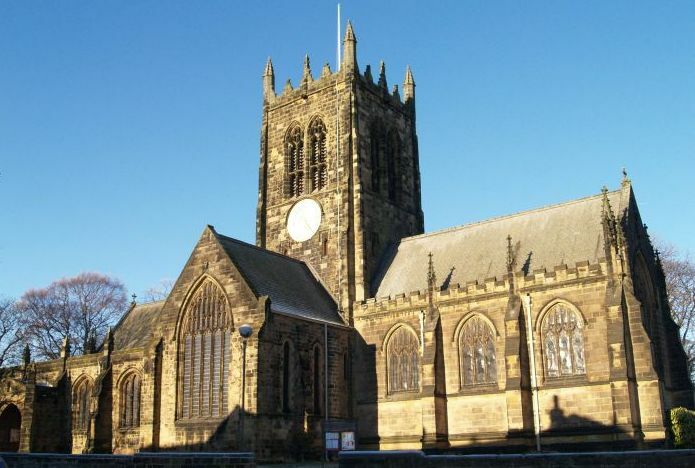 The crossing tower is also considered to be 13th century. 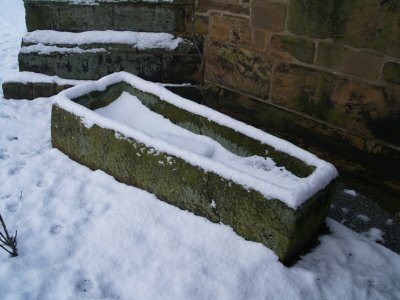 All Saints Parish Church, Northallerton : An old stone coffin, the much restored south door in the south transept, and under the south porch entrance, details of the much restored pointed arches of the south door and the church without snow! 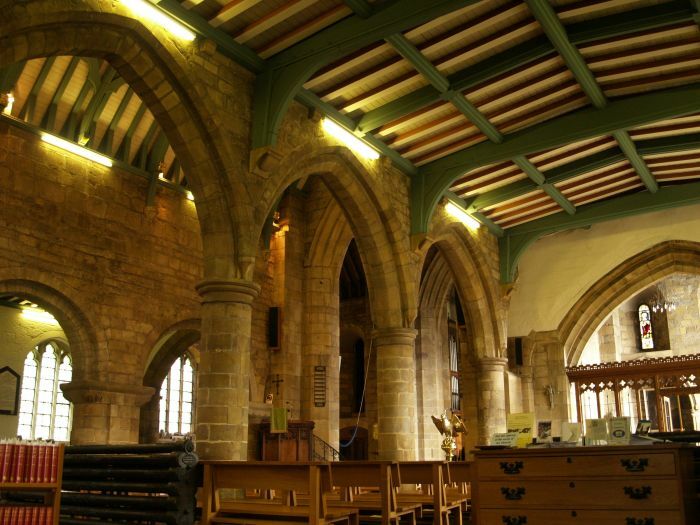 All Saints Parish Church, Northallerton: Looking down the nave into the chancel. 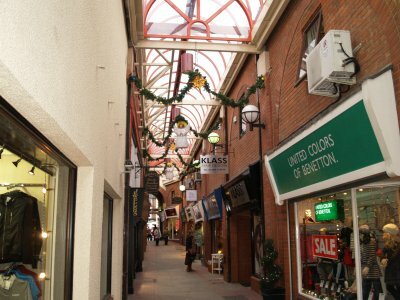 On the left are the curved arches of the north aisle and on the right the later pointed arches of the south aisle arcades. 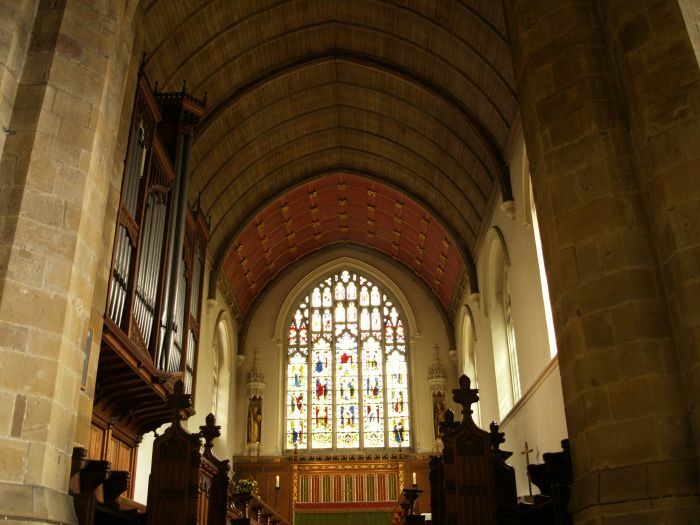 All Saints Parish Church: Looking across from the south aisle across the nave to the north aisle. 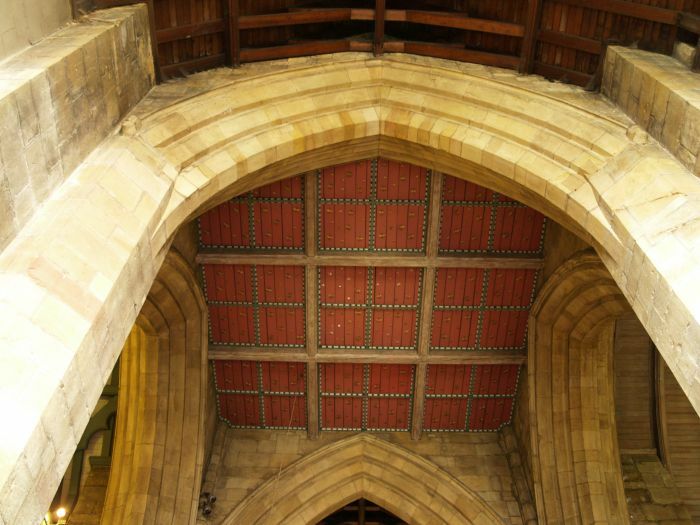 The pointed arches and pillars of the south aisle date from the late 12th century. 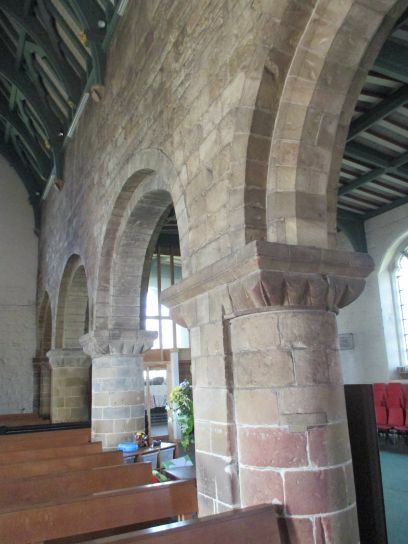 All Saints Parish Church, Northallerton: The arcade arches of the north aisle of the nave. 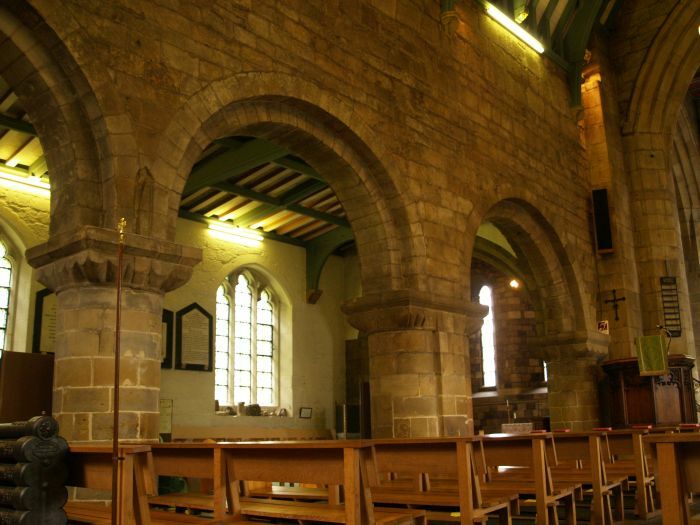 The pillars and arches of the north aisle are early 12th century. 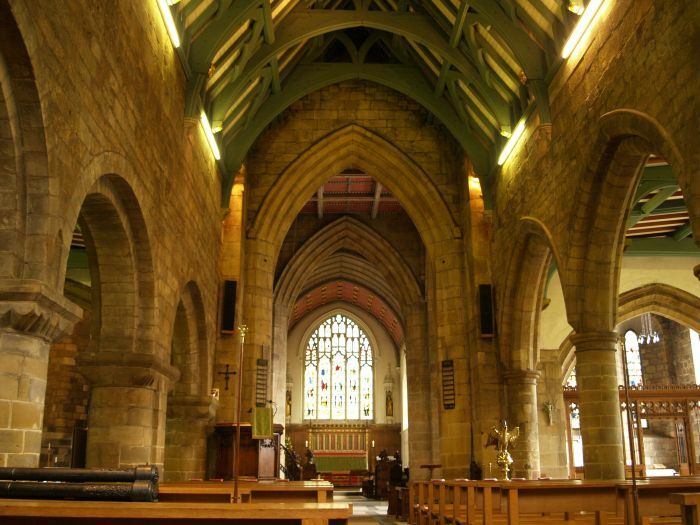 All Saints Parish Church: The north aisle chapel with its two tall lancet windows behind the altar. 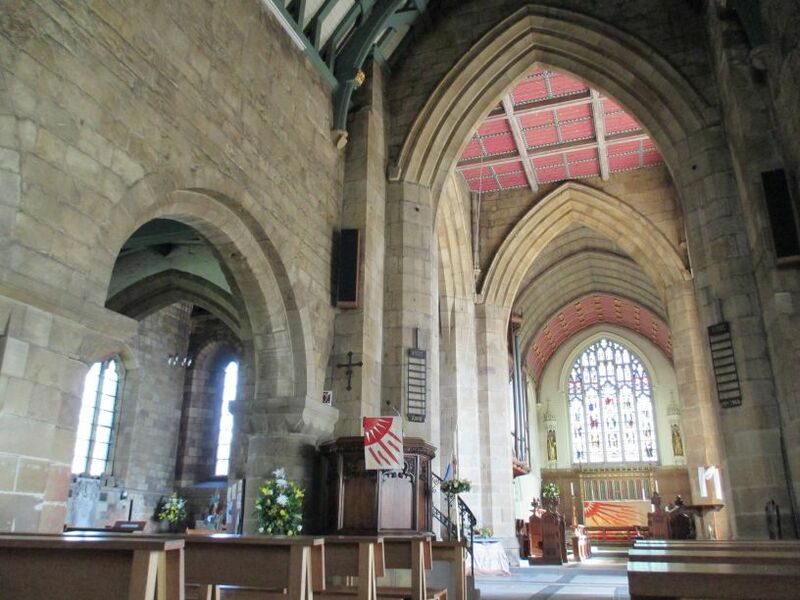 Looking from the nave under the arches of the crossing into the chancel of all saints, with the east end of the north aisle on the left. 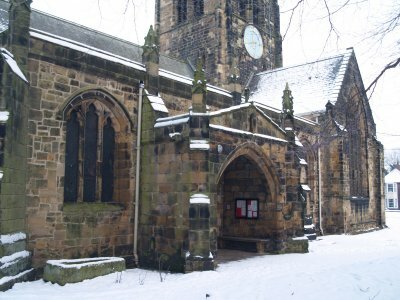 All Saints Parish Church: The organ, chancel, east window (dating from 1895) and altar. 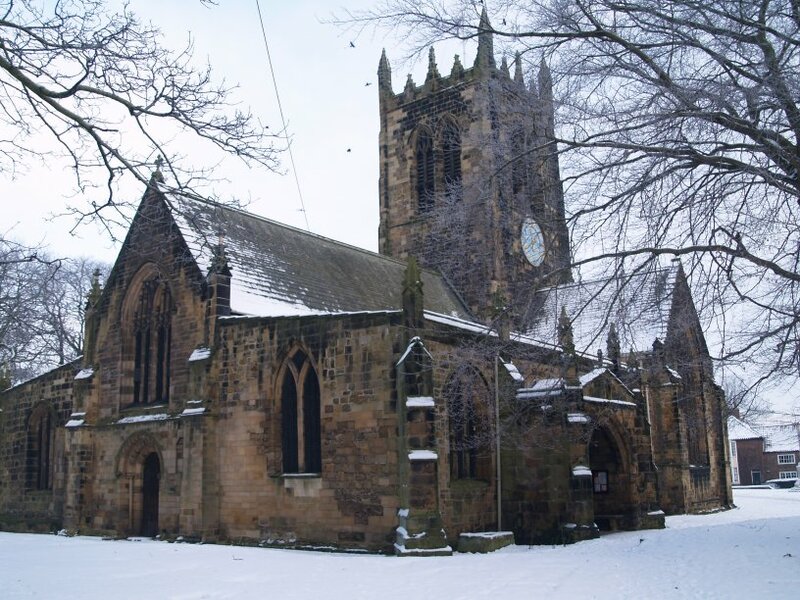 All Saints Parish Church: Some early Norman? 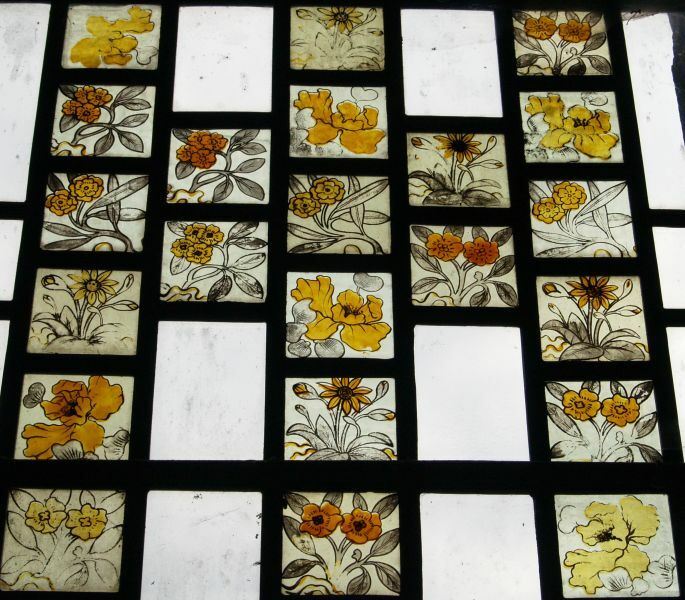 windows in the Lady Chapel at the east end of the south aisle. 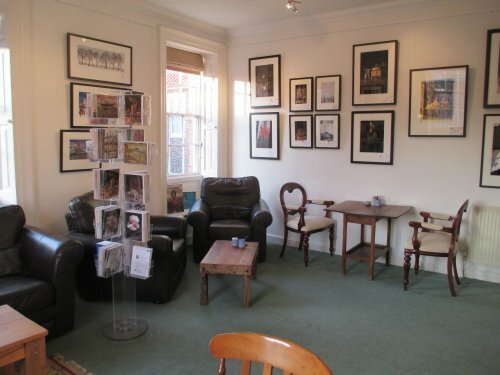 On the left is a picture of Christ carrying the Cross. 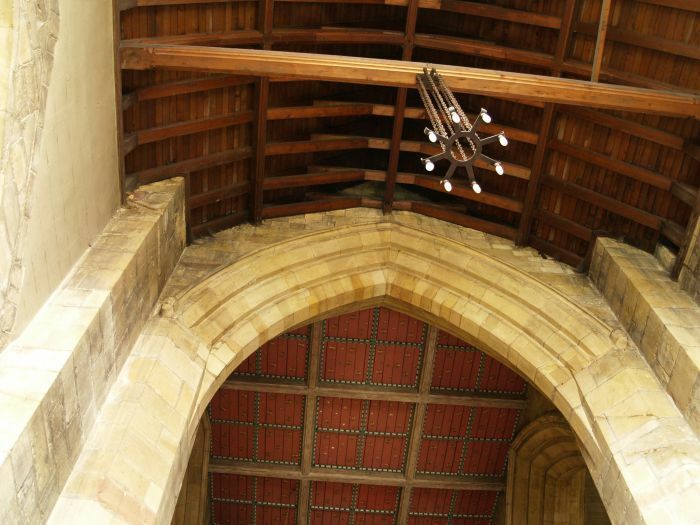 All Saints Parish Church: All four arches at the crossing below the tower which was built around 1420. 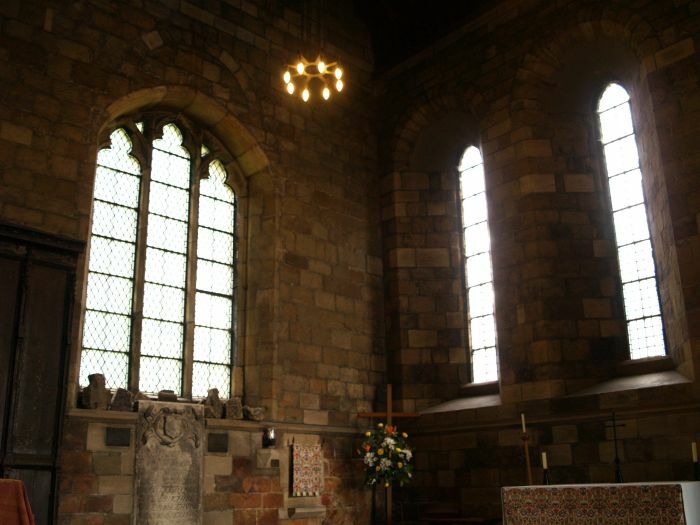 All Saints Parish Church: The plain west window. 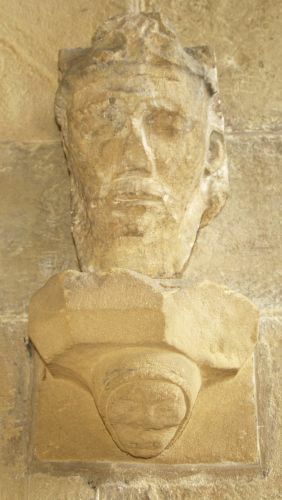 A curious face carving on one of the pillars of the arches of the nave and north aisle of All saints. 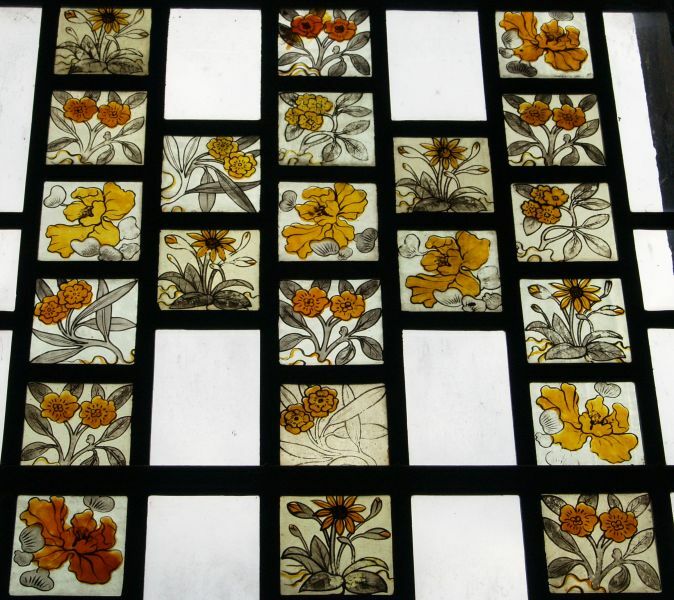 All Saints Parish Church: Some of the delightful stained glass window panels of flowers in the Memorial Window?. 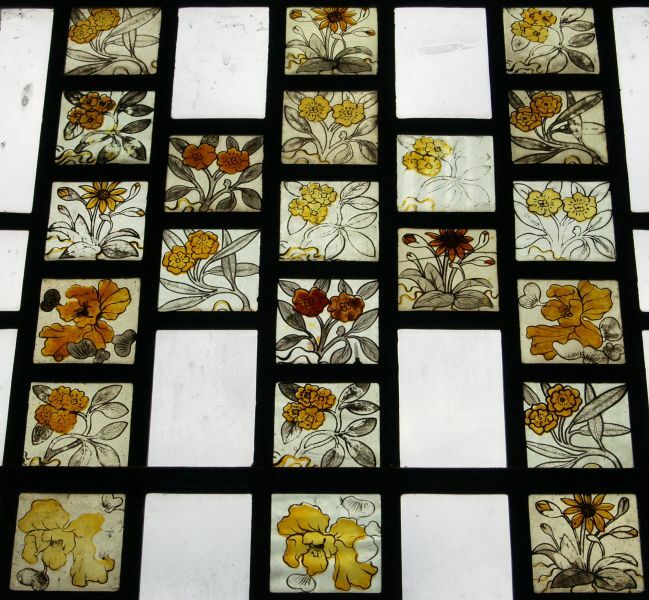 All Saints Parish Church: More of the 18th century highly decorated stained glass. 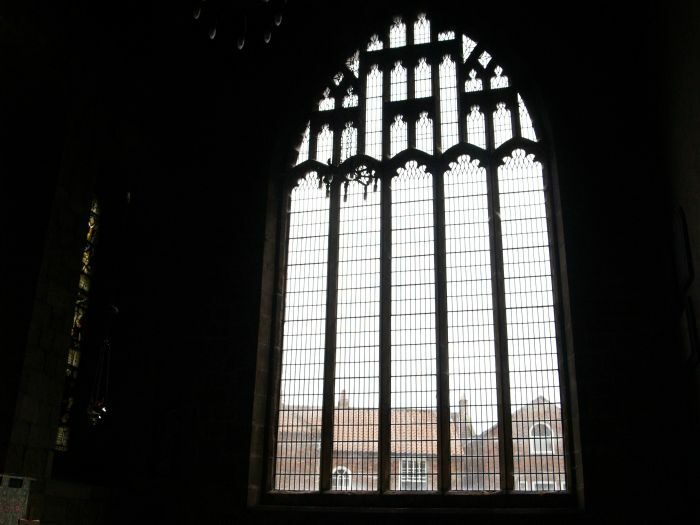 All Saints Parish Church: This window was put together in the 1960s. 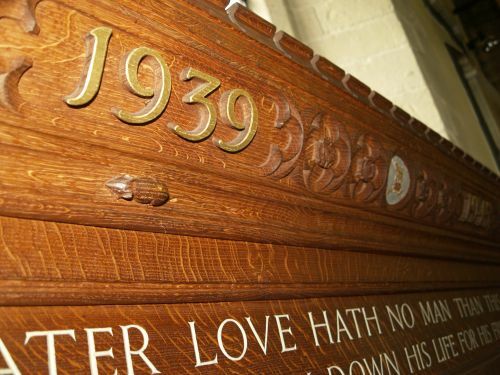 All Saints Parish Church: This Second World War memorial incorporates some of the beautiful oak carving by the 'Mouseman' - the mouse is central-left. 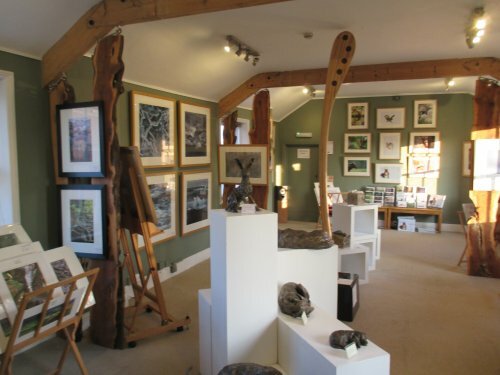 This is the work of the woodcarver Robert Thompson of Kilburn, whose trademark mouse appears on all his work. 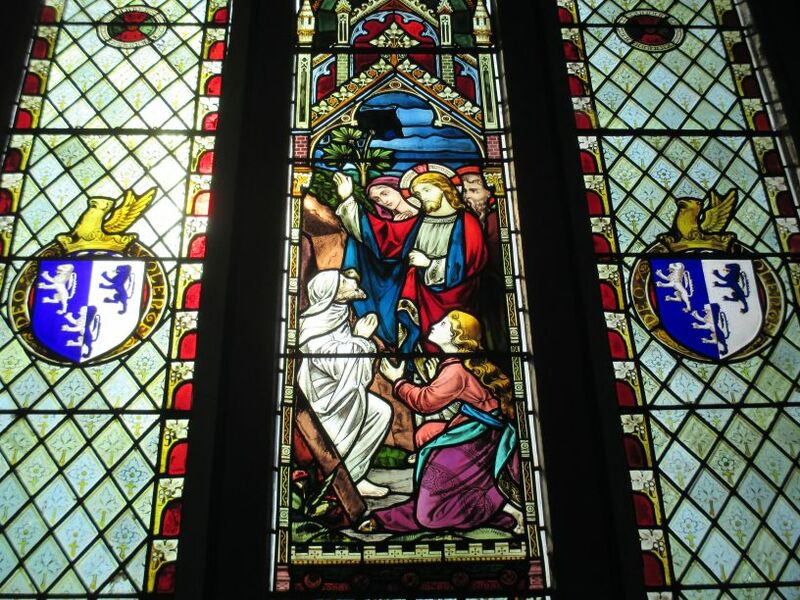 Stained glass window in the south aisle of All Saints Church, Northallerton. 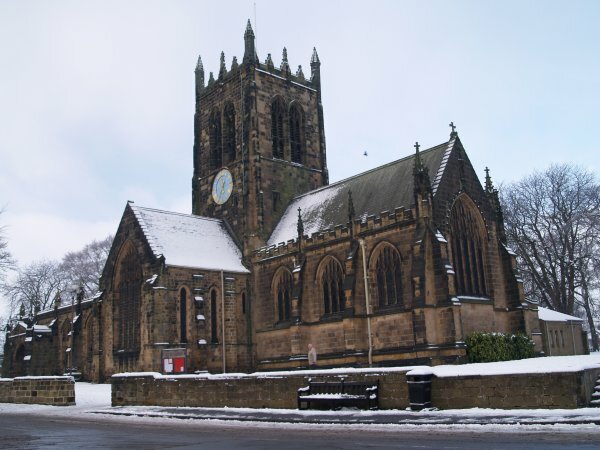 All Saints Parish Church: The 17th century stone font and its 18th century carved wooden font cover plus a medieval? 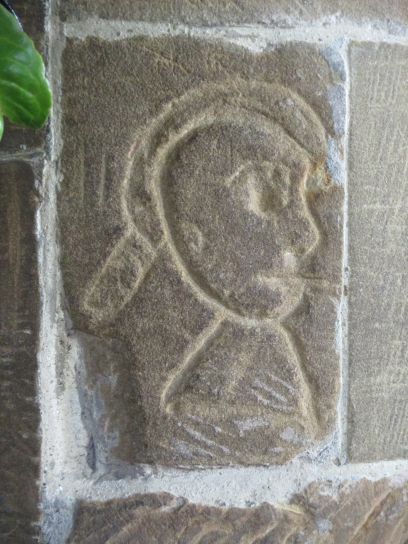 carved head in stone in the Lady Chapel - maybe St Oswald? 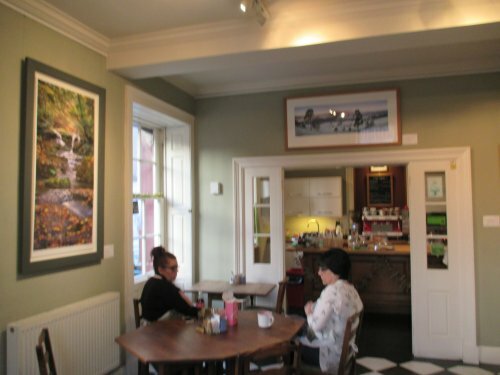 The Cafe in the Joe Cornish Art Gallery in Northallerton, is a great place for refreshment for coffee, tea, cakes or 'light' meals etc. 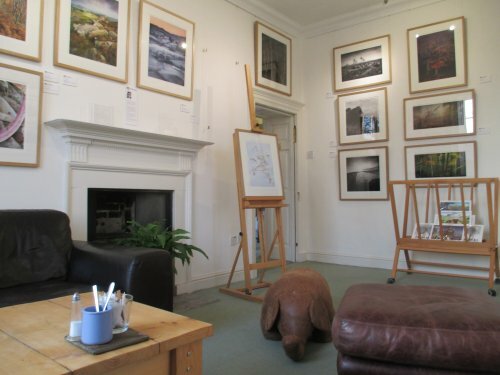 There are lots of great photographs and other arts and crafts from other local artists. 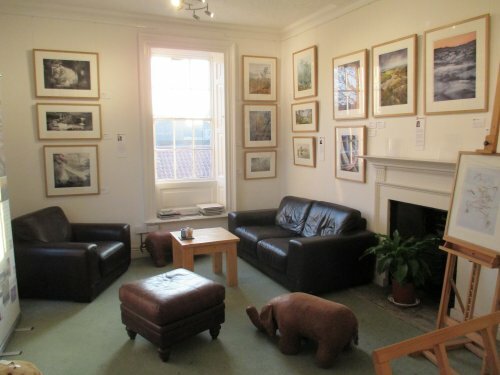 Along with the gallery rooms there is a great variety of interesting rooms to eat and drink in and lots of comfortable chairs and settees to relax in. 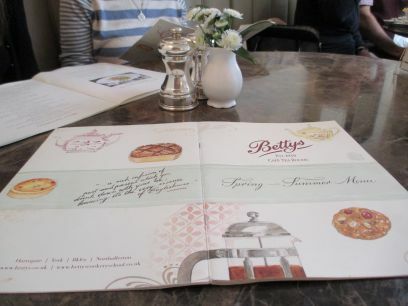 Bettys is one of the best cafes in Northallerton and the menu must be studied seriously! 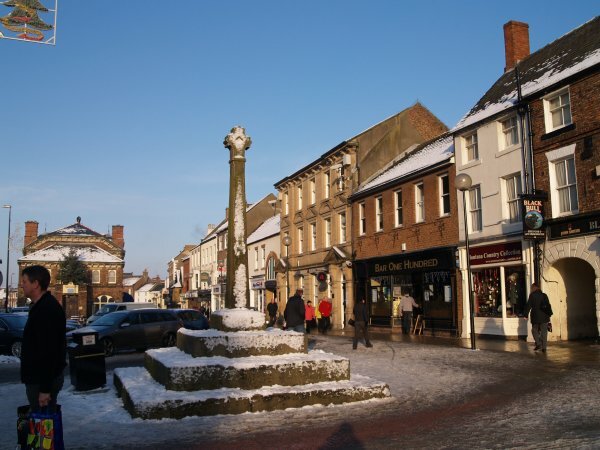 Northallerton, North Yorkshire, is a busy market town in the North of England. 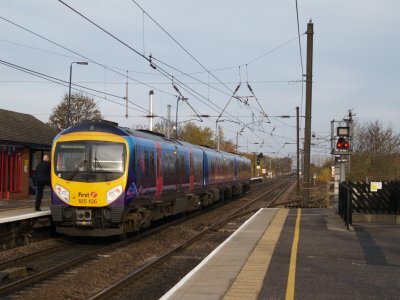 It is on the East Coast Main Line from London Kings Cross to Edinburgh Waverley stations. 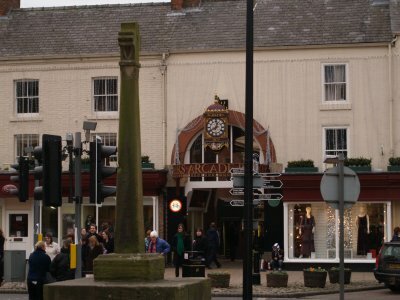 For a small town it has quite a good variety of shops and a market on Wednesday? 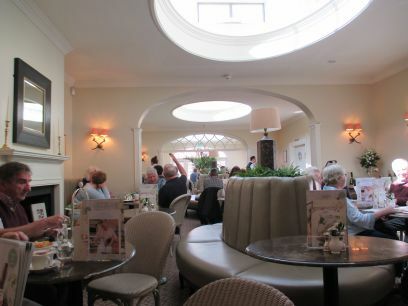 Barkers is good place to eat at a reasonable price and has a cafe in the Barkers Arcade entrance under a clock dated 1875 and a good meal can be had in the shop restaurant. 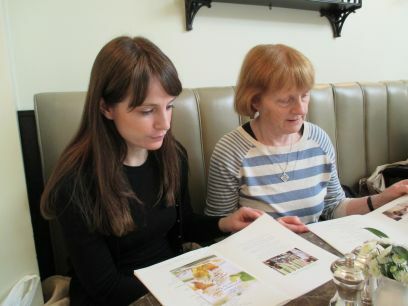 Barkers takes great pride in using locally sourced vegetables, meet and bread etc. 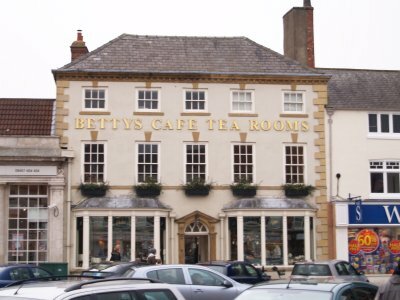 Betty's Cafe Tea Rooms (left) is very smart establishment, and good place to eat and is also near the Market Cross. 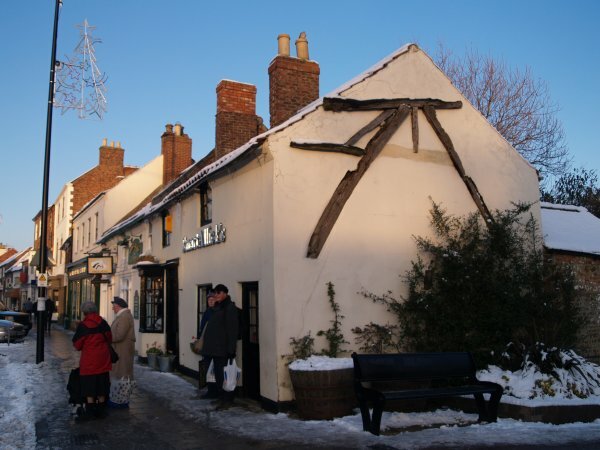 The Fleece pub (below left) near the Market Cross is almost as old as the Parish Church of All Saints since it has two medieval wooden gables. 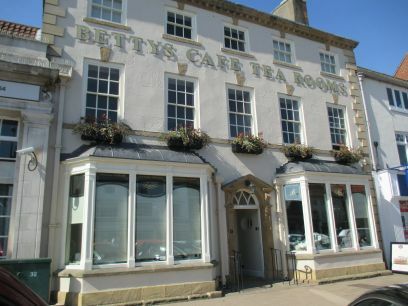 These are two of the most interesting buildings in Northallerton Town.